Fresh off his win in the New Hampshire primary, Republican presidential candidate Donald Trump can add this to his list of accomplishments: His best-selling book, The Art of the Deal has been adapted into a feature film. Adweek spoke with Chris Bruss, Funny Or Die's president of digital content, about how they were able to get Depp on board, the goal of producing more long-form content, and Alf. Adweek: How did you come up with this idea? Chris Bruss: We had done a similar project a couple of years ago, called iSteve, during the furor around all these Steve Jobs movies coming out. It was fun and it did well and so we'd always thought to ourselves: The next time we have that same kind of cultural touchstone moment, maybe we could do something interesting. We always kind of kept our eyes peeled for what was the right moment to do that again. We've done a ton of Trump-related content over the last couple months and it's always done very well. This was an idea that Funny or Die editor in chief Owen Burke had in a meeting with Joe Randazzo (head writer of Comedy Central's @Midnight), and Joe wrote the script during one of his hiatus weeks from the show. How did you get Johnny Depp to play Trump? Johnny was the first person on board. It all came together quickly after that. He was on board immediately. He had come into the offices for a meeting with Adam McKay and Owen joined the meeting and let Johnny know, "Hey we've got this idea, we've got this script" and pitched it to him. He committed in the room. As soon as he was on board, we moved full steam ahead and the production and the rest of the cast came together very quickly. How long did this take to produce? We shot this in early December; we only had four days to shoot it. We shot it basically in and around the Funny or Die office—there were a couple of other locations—but primarily we shot here. 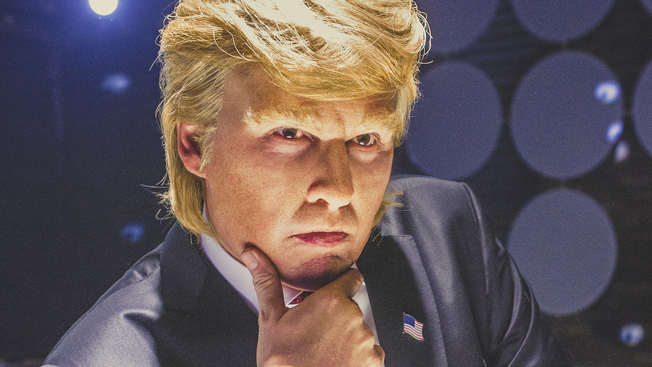 When we shot it, we didn't really know if Trump was the real deal. We knew that he was getting a lot of press, but we didn't exactly know how long he was going to stick around. As the weeks went on and Trump kind of gained in popularity and became a bigger and bigger sensation on the political scene, we realized that we were going to have a little bit more time than we thought to put this together. We were able to get Kenny Loggins to come on board to do the theme song, and Ron Howard to do the intro. It all just kind of came together at the perfect time, where we were able to release this the day after the New Hampshire primary. This is a fun way for us to be a part of that story. The movie is based on Trump's book, The Art of the Deal. How closely did you want to adhere to the source material versus adding in the current fervor about him? We make a lot of spoof film trailers. Essentially this is just a longer version of that. There are certainly some stories from the book that make their way into certain scenes in the film. But really, this was a comedic premise of this crazy, absurd person and having fun with that. It's highly fictionalized. I mean, Alf is [Trump's] best man at his wedding. But, he really did sue the NFL and he really did have to secure that property to build Trump Tower. All of those things really happened, but they didn't happen exactly the way that we portrayed them, obviously. At 50 minutes, this is one of your longer films. Are you going to be doing longer content like this? This is something we want to do more of. We always had our eyes peeled for the right time and topic to do something like this. I very much hope we don't wait as long to do the next one. The idea that Funny or Die is for short-form content and cable networks are for long-form content… I think that line has really blurred.